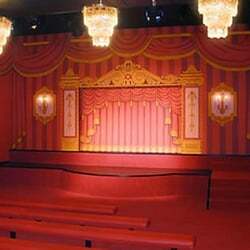 Pinocchio’s Marionette Theater began as touring company named Puppet Celebration, Inc., in May of 1999, founded by actor, writer, and Artistic Director David Eaton and Pady Blackwood, renowned marionette manipulator and “Howdy Doody” puppeteer. The Florida touring company presented string marionette puppet shows in elementary schools, civic theaters, libraries, Orlando’s Mennello Museum of American Folk Art, and, as Guest Artists, the Puppeteers of America 2002 national festival. That same year, our 501c3 not-for-profit corporation opened a special place, Pinocchio’s Marionette Theater, in Central Florida’s Orange County at the edge of the city of Winter Park, and there we “pulled the strings” for 6 years until Dave and Pady retired in 2008. The theater moved to a new location at the Mall in Altamonte Springs, Florida, where it had a Grand Re-Opening in 2009 under Executive Director Sean Keohane. In 2014, Puppet Celebration, Inc., returned to its roots as a touring company, presenting locally and around the country a variety of puppet shows, perhaps most notably Jane Henson’s “Nativity Story,” a moving Christmas piece with live sacred music and puppets built by the world-famous Jim Henson Creature Shop in New York. What started with a modest three performances a week grew to as many as twenty per week during peak seasons of Pinocchio’s operation at the Altamonte Mall. Our marionettes’ popularity has been heartwarming for the devoted staff, volunteers, performers, and generous donors who make our existence possible. You can support the important mission of this fantastic little world through our PayPal donation button and reach out to us through our CONTACT page. Our seasonal offerings include the marionette musical Santa’s Holly Follies and a marionette version of the classic Little Drummer Boy. And of course we have been honored to present, thanks to the kind generosity of Ibex Puppetry and the Henson family, Jane Henson’s Nativity Story. Scenes from Jane’s Nativity Story were featured in the nationally broadcast CBS TV special “A New York Christmas to Remember” from Paulist Productions. Many parents, educators, and critics have agreed that our productions are highly professional, often like miniature Broadway musicals. We have chosen our production team from the finest theater talent in Central Florida. Our writers, composers, directors, puppeteers, voice actors, set designers, scenic artists, orchestrators, and lighting and sound engineers have all been recognized professionals in their respective fields. The Little Mermaid 11 puppets, most of which are 18″ tall string marionettes, though there are a few small rod puppets as well; also various props and several colorful scenic backdrops. Pre-recorded dialogue, songs, and music make for an approximately 35 minute long show, setting the famous story in a Florida spring with mermaids and manatees. The Little Drummer Boy 15 puppets, most of which are 18″ tall string marionettes; with various props and set pieces, including the Christmas manger. The pre-recorded dialogue (with interstitial holiday instrumentals) tells a classic tale regarding a little boy recovering his lost faith thanks to a Nativity miracle. Approximately 40 minutes long. Hansel and Gretel 10 puppets, most of which are 18″ tall string marionettes, with various props and set pieces, including the Witch’s gingerbread house, and several hand-painted scenic backdrops. Pre-recorded dialogue and songs and music from the operetta, with a witch who is more funny than scary, in an approximately 40 minute performance. Pinocchio 10 puppets, most of which are 18″ tall string marionettes, with various props and set pieces, including Gepetto’s workshop and the Whale. With black light undersea puppets and a masked human character. An approximately 40 minute performance. Each of the touring marionette shows listed above are performed on our traveling string puppet stage, 15′ wide, 11′ high, and 10′ deep. The stage has its own simple lights and speaker sound system, which require a reliable electrical outlet. Set-up of our stage and show requires 3 hours at the venue. Strike time to dismantle and pack the stage and properties takes 2 hours. Our shows are best performed in a space where outside light can be excluded from the audience area to avoid distractions in the theater. The multiple goals of Puppet Celebration, Inc., have always been to help preserve the art and craft of marionette puppetry; to introduce children to live theater; and to teach our young audience theater etiquette. As we pursue our goals, we have always endeavored to combine high performance standards with uplifting cultural values for family audiences. The positive impact we have tried to make on the lives of young children over the years has been real and rewarding for the whole team. Before seeing our shows, it is likely that most of Central Florida’s children had never attended a live performance by marionette puppets. When children visit with us after a show, their expressions and comments let us know they are enthralled by what we are able to create specifically for them, either in our “candy box” theater, or on the road. For many children, our performances have been their first encounter with the lively arts. It is more than gratifying when these same children and their parents return to see puppetry magic again and again. Pinocchio’s has been fortunate to find outstanding vocal talents to speak the lines and sing the songs for the dozens of characters in its productions. They have included: Taylor Anderson, Pady Blackwood, Fred Bugg, Nicole Antonia Carro, Brett P. Carson, Nicole Carson, Jamie Donmoyer, David Eaton, Jim Howard, Scott Huhn, John Kennedy, Sean Keohane, Nita Laca, Suzanna Leigh, Sharon Lewis, Sarah Lockard, Elizabeth Lorenzen, Jen Mercer, Philip Nolen, Michael Paulauski, Paul Ricketts, David Schweizer, Kent Smith, Sage Starkey, Melanie Whipple, Tony Whitten, Susan Williams, and Timothy Williams.